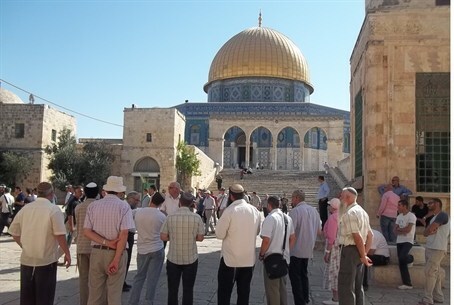 For years Jews have been allowed to visit the Temple Mount, the holiest place on earth according to the Jewish religion, but have not been allowed to pray there. In late 2012 police issued draconian instructions under which Jewish visitors could be arrested for merely appearing to pray. All that may change with MK Miri Regev’s appointment to head the Knesset’s Internal Affairs Committee. Regev (Likud) is planning a trip to the Temple Mount in order to weigh the option of permitting Jewish prayer at the site. In announcing her plans, Regev quoted from the Biblical prophecies of Isaiah, “Even them will I bring to My holy mountain, and make them joyful in My house of prayer; their burnt-offerings and their sacrifices shall be acceptable upon Mine altar; for My house shall be called a house of prayer for all peoples” . Regev’s announcement has caused anger in the Arab media, where several outlets have mistakenly reported that she is planning a visit to the Al-Aqsa Mosque, located on the Temple Mount, and is planning to allow non-Muslim prayer inside the mosque. Muslim groups in Israel have frequently accused Israel of planning to divide the Temple Mount or to rebuild the Temple. The Al-Aqsa Institute previously accused MK Moshe Feiglin of “defiling” the Al Aqsa mosque during a visit to the Temple Mount. Regev has issued a clarification that she is not planning to visit the mosque or to seek to permit Jewish prayer within the mosque.